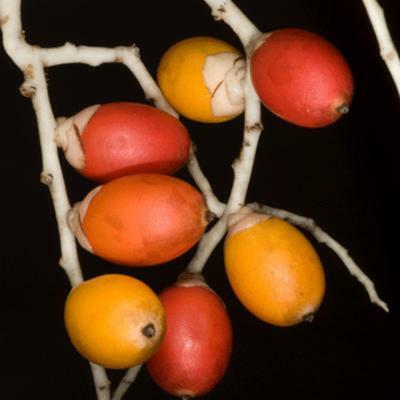 A solitary palm recently discovered on Biak Island in Indonesia, Adonidia maturbongsii is named in honour of Rudi Maturbongs (Universitas Negeri Papua), who collected the first herbarium specimens of the species, in recognition of his contributions to the study of palms in Biak. Type: Indonesia, Papua Province, Biak Numfor Regency, Biak Island, forest on the road side, main road from North Biak Nature Reserve to Biak town, July 2009, Heatubun et al. 971 (holotype K! ; isotypes BO!, FTG!, MAN!, NY!). Staminate flower 6.5 – 8 mm long, 2.5 – 3.2 mm in diam- in bud; sepals 2 – 2.4 mm long, c- 3 mm wide; petals 7 – 7.5 mm long, c- 3 mm wide; stamens 30 – 32, 4.5 – 6 mm long; filaments 1.5 – 4 mm long; anthers 3 – 3.8 mm long, 0.5 – 0.8 mm wide; pistillode c- 5 mm long, 1.2 – 1.4 mm in diam- Pistillate flower 4.5 – 5 mm long, c- 4.5 mm in diam. ; sepals 3 – 4 mm long, 4 – 4.5 mm wide; petals 4 – 4.5 mm long, 3 – 3.5 mm wide; staminodes 2 – 3; gynoecium c- 4 mm long, c- 3 mm in diam- Fruit 24 – 31 mm long, 14 – 16 mm in diam. ; pericarp 1.5 – 3 mm thick, endocarp 23 – 30 mm long, 12 – 12.5 mm in diam- Seed 14 – 20 mm long, 9.5 – 12 mm in diam, ellipsoid (Figs 4, 5). Distinguished from other genera of subtribe Ptychospermatinae (tribe Areceae) by its moderately robust, solitary habit, arching leaves, broadly lanceolate pendulous leaflets with wide, concave, praemorse apices, white inflorescence axes and terete, straw-coloured endocarp with broad, adherent, longitudinal fibres interspersed with very fine fibres. The latest molecular phylogenetic evidence (Alapetite et al. 2014) contradicts the earlier study (Zona et al. 2011) and most strongly indicates a sister relationship with Jailoloa, though one low-copy nuclear data partition (AG1) indicates an alternative, poorly supported placement as sister to PonapeaBecc. Compared to Jailoloa, Manjekia is more robust with very different leaflets (ascending, narrow, leathery leaflets in Jailoloa), more stamens per staminate (c. 16 in Jailoloa) and contrasting inflorescence morphology and fruit colour (purple inflorescences branched to three orders with orange-yellow fruit in Jailoloa). Manjekia differs from Ponapea in its elongate, lageniform pistillode (short and conical in Ponapea) and the terete seed with ruminate endosperm (seed ridged in Ponapea, or if terete then homogeneous endosperm). Manjekiamaturbongsii was originally described in Adonidia (Baker & Heatubun2012) based on molecular phylogenetic evidence from two low-copy nuclear genes (Zona et al. 2011). Morphological similarities to the existing species of Adonidia, A. merrillii, were identified, such as the limestone habitat of both species, their white inflorescences branched up to four orders, the fruits with red epicarp, the endocarps with adhering pale, flattened, longitudinal fibres interspersed with finer fibres, and seeds with ruminate endosperm. However, differences between the two taxa were also highlighted by the authors (Baker & Heatubun2012). Manjekia bears leaves with broad, pendulous leaflets in a single plane with wide, concave, praemorse tips, whereas leaflets of Adonidia are ascending, narrower and in slightly different planes with inconspicuously praemorse or bifid tips. In addition, the staminate flowers of Manjekia contain fewer stamens (30 – 32) than those of Adonidia (45 – 50). 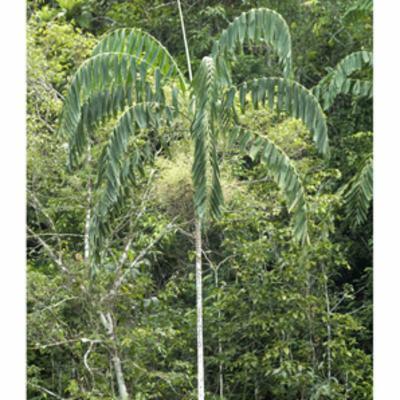 This palm is immediately recognised by its tall, elegant habit combined with its arching leaves with broad, pendulous, conspicuously praemorse leaflets and profusely branched greenish white inflorescences. Reports of a distinctive, undescribed species of Ptychospermatinae from Biak began to circulate during the 1990s (Zona 2000; Baker & Heatubun2012). 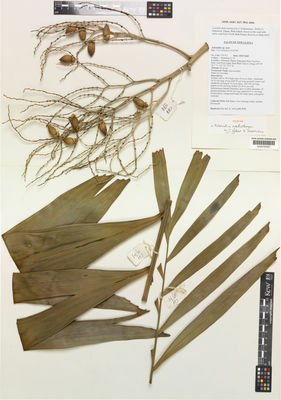 The first herbarium specimens were made by Rudi Maturbongs in 1998, although the material was at first overlooked at Kew as a robust form of Drymophloeuslitigiosus (Becc.) H. E. Moore. Having observed it during a short visit to Biak in 2000, WB arranged an expedition to Biak in 2009 with CH to secure adequate material for morphological and molecular study. The new generic name is based on Manjek, the local name in Biak dialect for this palm. The species epithet, coined previously (Baker & Heatubun2012), honours Rudi Maturbongs, palm expert at UniversitasNegeri Papua and first collector of herbarium specimens of the species. Lowland forest on limestone with thin soils and many sink holes, 80 – 170 m elevation. Known locally as manjek, this palm was described by Kew scientist William Baker and Charlie Heatubun (Universitas Papua, Indonesia) in 2012. Adonidia maturbongsii is restricted to Biak Island (Papua, Indonesia), where it has been found at 80-170 m above sea level. 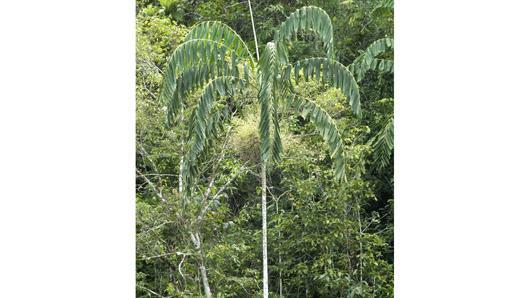 Overview: Solitary, mid-storey to emergent palm. Stem: Brown with white blotches and prominent leaf scars, 10-15 m tall, 10-20 cm in diameter, tapering towards the apex. Leaves: Forming a crown of about ten arching leaves. Sheath up to 70 cm long, pale, dull green forming crownshaft (conspicuous cylinder formed by tubular leaf sheaths at the top of the stem) up to 90 cm long. Petiole (leaf stalk) up to 45 cm long. Each leaf divided into 25-30 pairs of leaflets. Leaflets are borne in a single plane and are broad and pendulous with wide concave tips. Inflorescence: 60-70 cm long, branched to four orders, axes white, rubbery. Buds in triads (clusters of three), spirally arranged. Male flowers: About 7 mm long with 30-32 stamens (male organs). Female flowers: About 5 mm long with only a few, minute, tooth-like staminodes (sterile stamens). Gynoecium (female element) pear-shaped. Fruits: About 3 cm long, ellipsoid, ripening through orange to red. Seeds: About 2 cm long, ellipsoid. 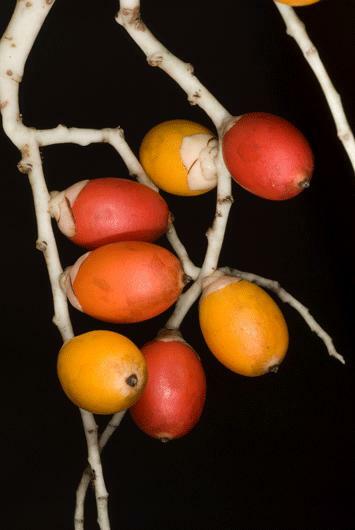 Adonidia maturbongsii is threatened by ongoing forest degradation. It is protected in the North Biak Nature Reserve. The stem is used locally for flooring and pillars in traditional houses. Dried specimens of Adonidia maturbongsii are held in Kew's Herbarium, where they are available to visitors from around the world, by appointment. Endangered (EN) according to IUCN Red List criteria. The stems are used for flooring and pillars in traditional houses. Baker, W. J. & Heatubun, C. D. (2012). New palms from Biak and Supiori, western New Guinea. Palms 56: 131–150.